This etymological tour de force was written by a self-taught farmer's son who became a world-famous linguist and senior editor of the Oxford English Dictionary. By the time he was a teenager, Henry Bradley (1845-1923) had immersed himself in several classical languages. His achievements were ultimately recognized with honorary degrees from Oxford and Heidelberg, and fellowships at Magdalen College and the British Academy. This 1904 work represents the culmination of his philological career. 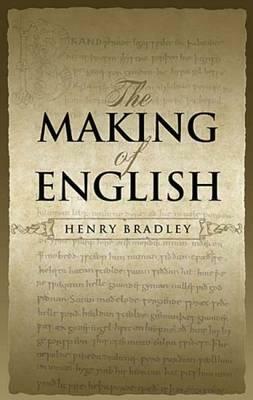 Scholarly yet nontechnical, The Making of English explains in simple terms the relationships between English and other tongues--Greek, Latin, German, Spanish, and French. Topics include the similarities and differences between English and German, characteristics of Old English, and the composition, derivation, and root-creation involved in the process of the making of words. The author also discusses changes in meaning that occur over time, and profiles some historical figures who were influential in shaping the English language.